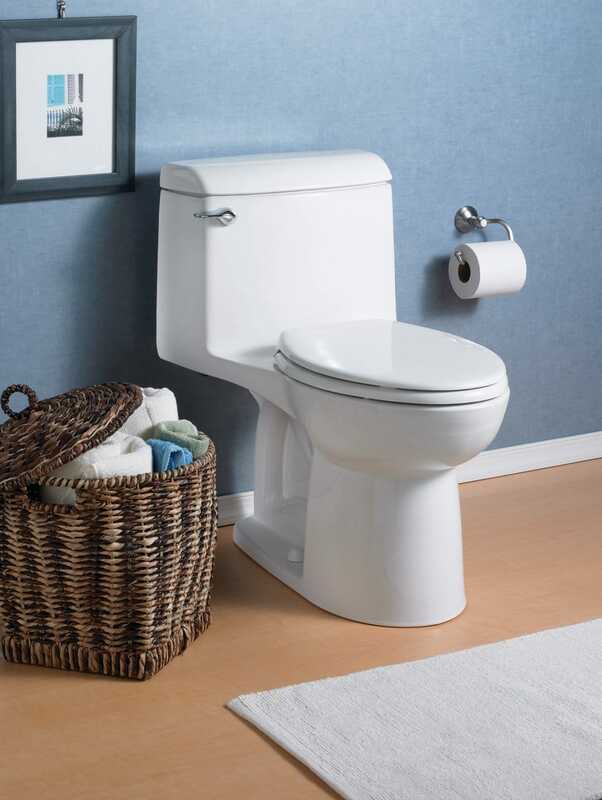 American Standard Champion 4 Toilet is one the top of the leaderboard when it comes to a 100% clog-free performance and has a faster, powerful and quieter flushing system that is water efficient as well. Read our American Standard champion 4 review to learn more (check latest price). 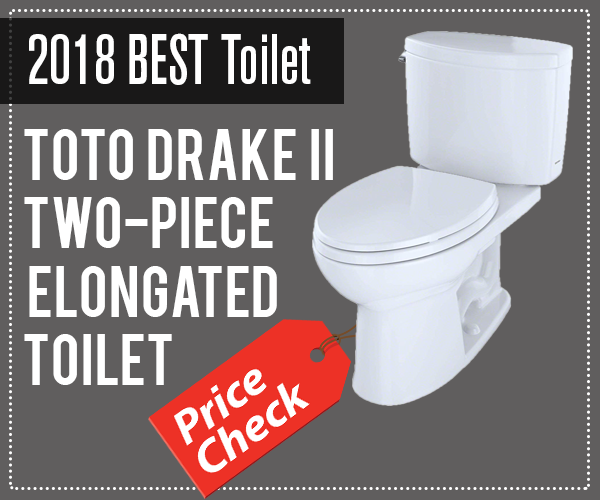 Undoubtedly, American Standard is one of the leading brands in the world, and its Champion-4 One-piece elongated toilet is on the top of its list of best toilets. This model is one the top of the leaderboard when it comes to a 100% clog-free performance and has a faster, powerful and quieter flushing system that is water efficient as well. The toilet is manufactured in vitreous China, and its surface finish inhibits the growth of mold, mildew, and other stains, ensuring a long lasting life of your toilet. Above all, being a one-piece toilet makes it easier for its users to clean it. The American Standard Champion-4 has an elongated bowl with a rim of 16 ½ inches and is ADA compliant. Its glossy color and unique design give it a modern touch of bathroom fixtures. It only consumed 1.6 gallons per flush and functions with the natural force of gravity that pushes the water with full force into the bowl, leaving the toilet 100% clean and stains free. The Champion-4 has its cistern combined making it compact and smart. The company has used EverClean Surface that makes it even glossy and elegant. This innovation also reduces the stains and prevents the growth of mildew, bacteria or mold on the toilet. 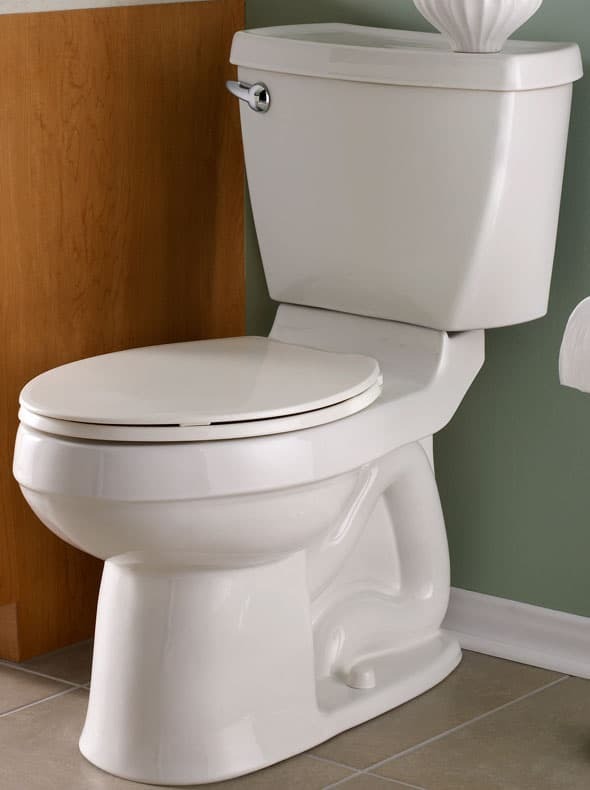 Being a one-piece toilet makes it convenient for you to clean it easily and quickly. You don’t need to spend a lot of time or put in a lot of efforts. Simply take your regular toilet cleaning detergent, and start cleaning. Furthermore, the shape of its bowl, the height of the seat and levered flush mechanism makes it ADA compliant. You won’t regret your decision after buying this revolutionary and innovative toilet. This is something that makes the Champion-4 stand out from other toilets. What makes an elongated design a convenient one is that it provides extra support for your thighs and additionally, the elongated models are ideally perfect and comfortable for the elderly and disabled persons. Not only this, but the elongated designs also prevent clogging and is ideal for bathrooms that don’t have urinals for men. Though the one-piece toilets are often a bit costly as compared to the two-piece toilets, it’s worth it. One reason is that you only have to install a single unit, rather than two different units. Secondly, you don’t have to hassle with adjusting the water tank system properly, and lastly, one-piece toilets are easier to clean, and they inhibit the growth of mold, mildew, and smell causing bacteria. Champion-4 is ADA compliant from every perspective. It has an ideal height that makes it comfortable for all age groups. Click here to check other ADA compliant top rated toilets. If you notice, it is quite taller as compared to normal toilets. This gives more support to the body and puts less strain on the legs when you are sitting on the toilet seat. Both the tall and short people will find it convenient sitting on Champion-4. 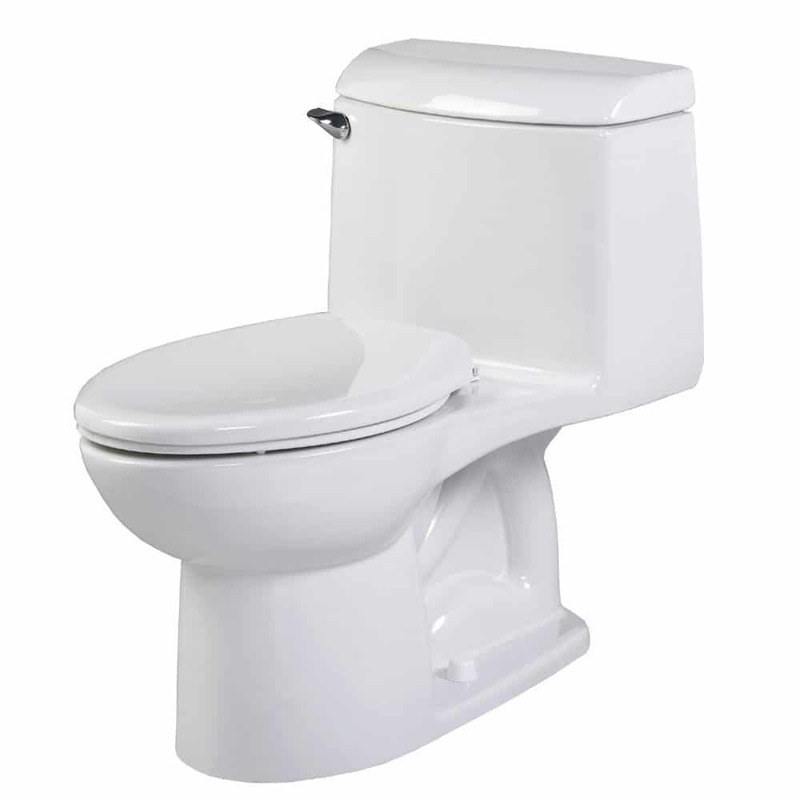 American Standard Champion-4 Toilet comes with a limited warranty of 10-years. This is the best warranty offered by any other brand in the toilet industry. The toilet has been proven and tested to provide an outstanding flushing system and is durable as well. You don’t need to worry about your toilet. It’s solid as a rock! Having a unique design is not enough for an elegant toilet. If it doesn’t have a powerful flushing system, it’s of no use. 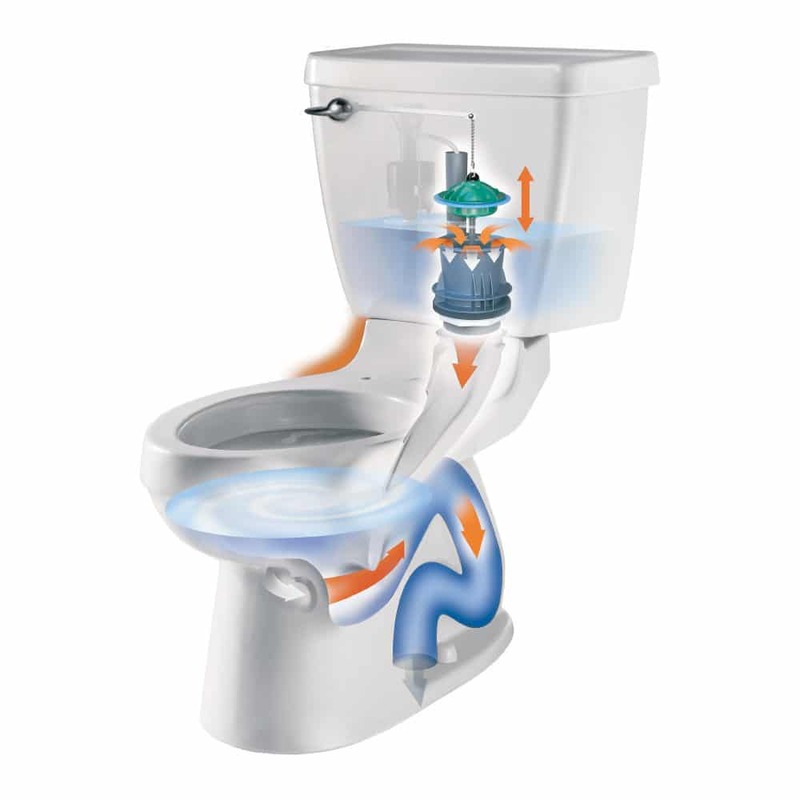 However, American Standard Champion-4 Toilet has the best and most powerful flushing system that is water efficient. It flushing valve has a 4-inch piston accelerator along with a wide open 2-3/8 inch fully glazed trapway that prevents any clogging. When the flush button is pressed, its flush valve pushes the water with full pressure, and can move a larger mass, 40% larger than the standard trapway. The company tested their flushing system by flushing out a golf ball that swirled down the bowl without any problem. American Standard Champion-4 uses EverClean surface that helps in a fully neat flush. 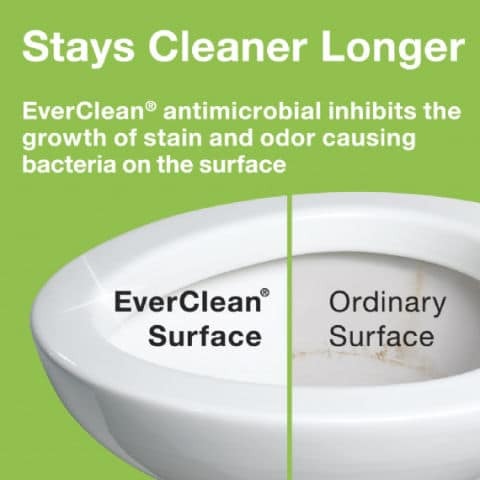 EverClean surface prevents the growth of bacteria and mildew or any other microbial. Apart from this, the toilet itself is convenient to clean from outside. Being a single unit, you can clean it from every side hassle-free. Last but not the least, Champion-4 gives you the ease of installation. Its ergonomics are so that it can easily fit in 12-inch place. Being a one-piece toilet it is heavier, but it makes it easier for the plumber to install it. If you have the skills of plumbing you can give it a try, else hire a skilled plumber for this job. Based on the overall American Standard Champion 4 Toilet Review, we have find out its pros and cons that are listed below. Right height with siphon action jetted bowl. Water efficient, consuming only 1.6 gallons per flush. Powerful flushing system that cleans the toilet. Has a 2-3/8 inch fully glazed trapway. Perfect for all age groups and is affordable. Comes in 3 color options i-e White, Golden, and Bone. Because champion-4 is a one piece toilet, this makes it heavier and a bit costly as well as compared to the 2-piece models. Gives the ease of installation but still requires the assistance of another person because it is heavier. There is no doubt that American Standard Champion-4 is touted to deliver quality and a comfortable experience to its users. It is a whole innovation in the toilet industry and makes it users happy with its outstanding features and performance. This is by far the best toilet that guarantees to compliment all your needs. Learn more about American Standard Champion 4 Toilet on Amazon and take a look at its latest price!